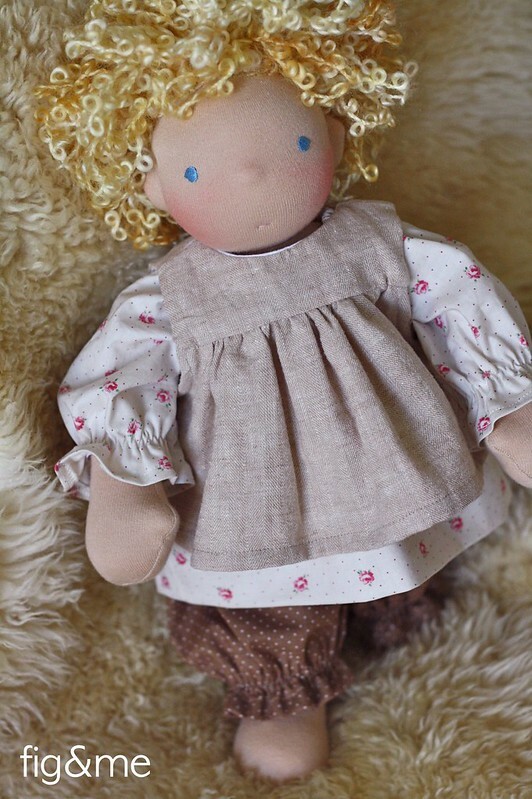 I want to tell you a cute story, that ended up in the creation of a very sweet doll. 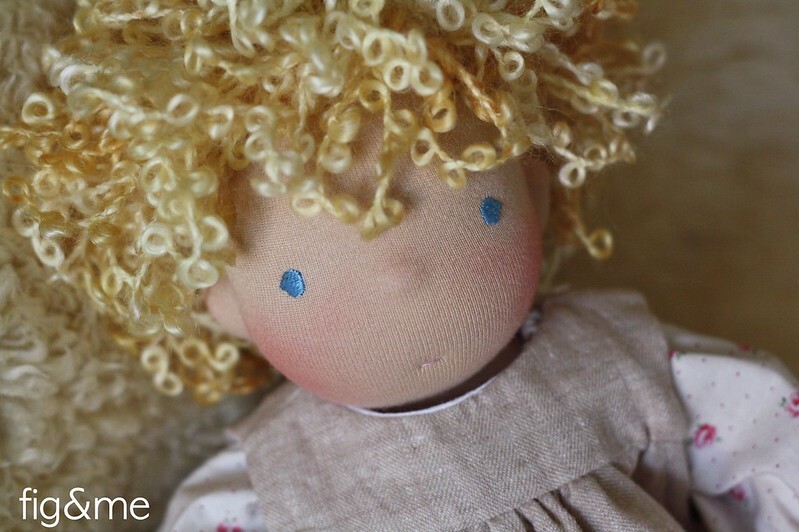 A while ago, a person showed me photos of her children playing with sweet Eire, a doll I made earlier this year. The photos brought lots of smiles to my face, and I was so interested in seeing the children with the dolls, enacting scenarios. But...there was one little person in those photos that caught my attention fully and completely. Her little daughter Margot, just kept me mesmerized. Something about her hair, lovely, short, curly, in the most amazing shade of blonde. Her fantabulous ears, popping out of her hair...like saying "hi, we are here to listen everything you have to say", her beautiful eyes. Those eyes kept popping in my head, while I was at work with other dolls. 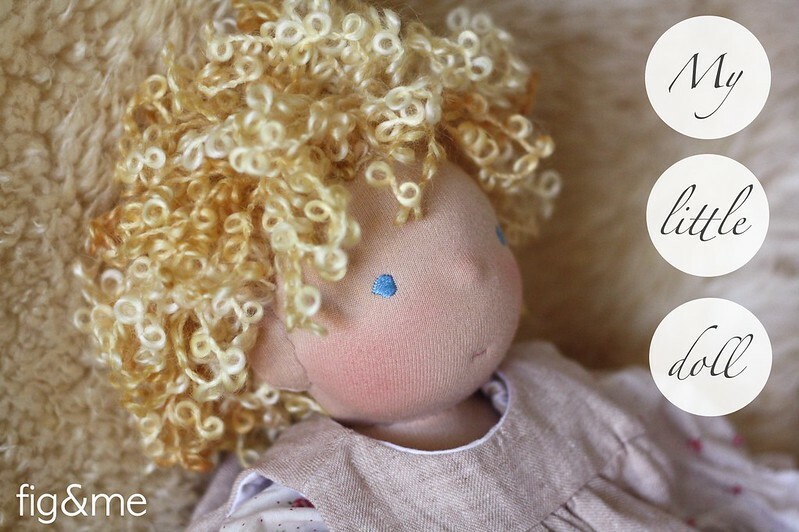 I started having dreams of making a doll just like her, and so I told her Mom about it. 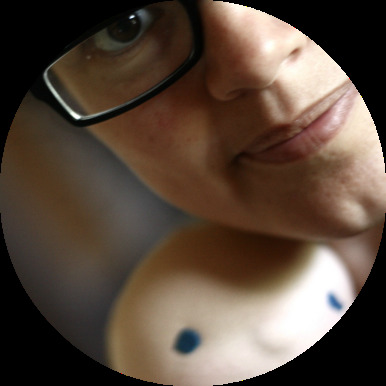 A part of me felt a bit weird, as I didn't want her Mom to feel awkward about showing me her photos. But she was delighted that I wanted to make a doll in the resemblance of her daughter. Whom I've learned over the last five or six months, is quite a personality. Naked dancing being one of her most favourite activities. Who reminded me of a dollmaker friend, who has dreams of doing just that sometimes. And I finally did. I finally created this little doll that has been in my head for quite some time. Every now and then, she would pop into my dreams, and ask me about what she was going to wear. I envisioned her with some rather old-school style of clothes...something simple, but sweet. Since Eire is 13" tall, I decided this new doll was to be the same size so they could play out some sister and friend scenarios. So I present you Miss Layla. 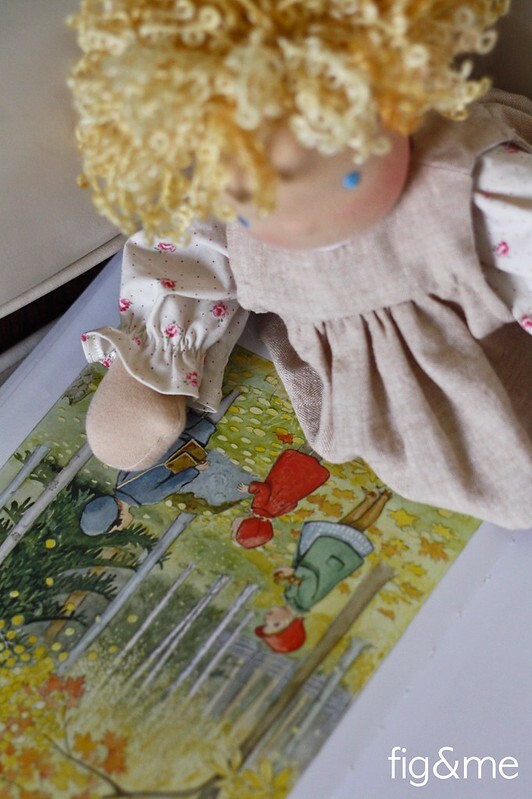 She is a very studious little doll, who loves to look at pictures of the Fall. Perhaps I have influenced her a bit too much? Layla cannot wait to go down south to the East coast and meet her adoring sister Eire, and a few of her french friends. She plans on convincing everybody to do as she pleases with those big blue eyes. If they don't bend to her every wish, then she plans on showing them her smile or maybe doing a little pout for them. She is very sweet, but she does have an agenda: "to get all the chocolate". Brace for impact! I hope you enjoy staring at Miss Layla, as much as I have these last few days. Making her was one of my dreams come true. Just as I saw her in my dreams, here she is. Now, I need to go and have a meeting with Thumbelina, my next Story Time doll, who refuses to wear shoes. See you soon! Sep 30 A ramble, and a tumble.